Caption slip reads: "Photographer: Mercurio. Reporter: Ostler. Assignment: Guided missile plant, Pomona. 13-14: Looking west at Manufacturing Building No. 2, a 17-acre one story structure of the Naval Industrial Reserve Ordnance Plant. A compressor building can be seen at left. 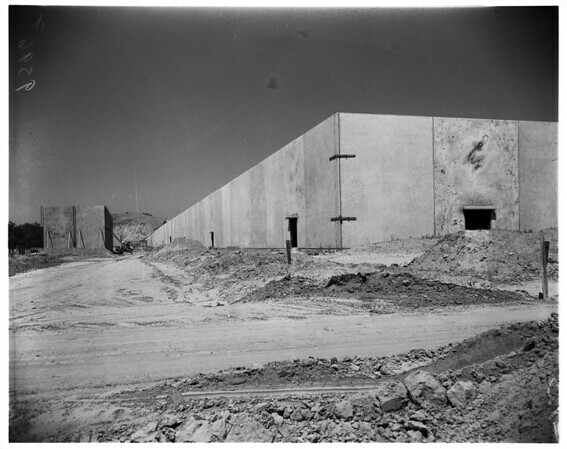 28: View of Administration Building presently under construction of the Naval Industrial Reserve Ordnance Plant as seen from the East looking West. At right foreground is the 17-acre manufacturing building. The Engineering building can be seen in far background. 27: Looking east along side of the 17-acre manufacturing building. A compression building can also be seen at right".